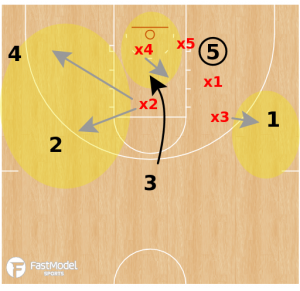 This article on the tactics used by Loyola Chicago to double team the low post was posted to the FastModel Sports Basketball Plays and Drills Library by Matt Wheeler. Loyola-Chicago doesn’t have great size in the post especially when their starting 6’9″ center Cameron Krutwig goes to the bench. So they will double team when teams try to post them up. They will usually bring the extra defender from one of three areas: from the top, from the baseline and from the closest perimeter player. Skilled teams can make you pay for putting an extra player on the ball. Passing it out of the double team will put the defense in outnumbered situations. 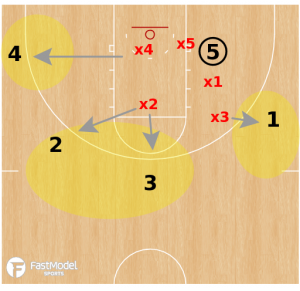 The Ramblers excel in rotating out of these situations to get matched up before the offense can make them pay. x3 double teams 5 in the post. x4 cuts to the rim. 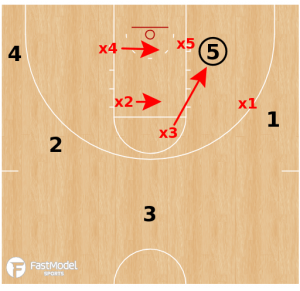 x4 double teams 5 in the post. x2 cuts to the rim. 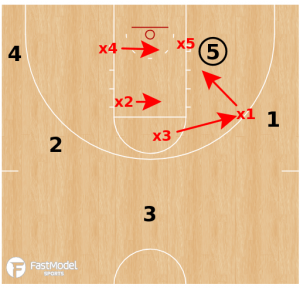 x1 double teams 5 in the post. 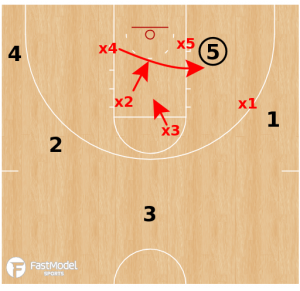 x3 rotates to take away the pass to the wing. x3 denies the pass out to 1.
x2 takes the first pass to the top. x4 takes the furthest pass to the corner opposite corner. x2 bumps the cutter then must close out on the two furthest passes. x4 denies the cutter and protects the rim.